Home » Category archives "District Council"
Proposal: Conversion of barn to ancillary accommodation. Erection of farm office and stables, removal of steel framed building and stables and replacement of manage with courtyard with parking. Proposal: Erection of two storey and single storey rear extension with external alterations. Comments, including the reference number, to SNC by 12 March 2019. Adrian Nicholas, Specialist Technical Advisor at SNC ( t 01508 533722; anicholas@s-norfolk.gov.uk ) has written of contact with Group Lotus and discussions about their Hethel track use and related noise/inconvenience to neighbours. Group Lotus are to reinstate their periodic email updates sent to residents living near their site. These will provide information about the company’s activities, including planned use of the Hethel test track. But, they need contact details and confirmation that the recipients are willing to receive the emails. Additional documents have been posted on the SNC website in support of the application. Comments from the public are again welcomed although the closing date is rather close – 4th January 2019. With respect to the planning application 2018/1658, the advice remains to focus on material considerations (remember the image attached to the previous post); this message has been heard and the comments appearing on the SNC planning site are making their point very well. A number have revisited their comments and recast them in the light of the guidance. SNC planning site is currently carrying 106 documents the vast majority of them from parishioners. Those who are not able to use the technology for whatever reason have used the postal system to get their comment in. The 450 voters in the village all have a chance to make their contribution and I expect at least 116 from those attending the Parish Council meeting! The Parish Council’s draft minutes are posted on this website in the Council’s pages. We were waiting for Cllr. Hardy to provide us with the text of his statement made at the opening of the Open Forum part of the meeting. The Parish council’s own objection statement is on the SNC website. Normal consultees plus a few others such as the RSPB and Norfolk Wildlife Trust have been invited to consider the parishioners’ on-line comments (to make use of local knowledge) and to submit their own. Talk to SNC IT about the on-line comments/registration issue – is there a reason for these problems, can it be resolved? We are happy to help anyone who is experiencing difficulties with registering on the planning pages of the website to enable them to comment online. As far as I am aware, we have not been contacted directly to notify us of anyone experiencing difficulties. Details are given on the Council’s website, the consultation letters and site notices about alternative methods of submitting comments which includes by e mail or in writing. 3. Confirm the default basis for a planning application when no (real) evidence presented for Traveller status. Any application is always considered on its own merits and in accordance with national and local plan polices and any other material considerations. If the applicant submits evidence to say they meet the definition of a traveller, for planning purposes, then this will be a material consideration and the application considered in accordance with local plan policy DM3.3. A new dwelling outside the development limits would also need to be considered in light of paragraph 11 of the National Planning Policy Framework (NPPF) and local planning policy DM1.3. Material consideration would also need to be given to the Council’s housing land supply in the rural area and at present the Council is applying material weight to evidence in the Strategic Housing Market Assessment (SHMA) which shows we have a shortfall. Clearly other policies in the local plan will also apply and will need to be taken into account as appropriate. The case officer is currently seeking clarification from the applicant and once received this will form part of the application. 5. Examine whether there is a breach of GDPR in insisting that names & other details are to be published and not offering to withhold them. (perhaps a “name & address supplied” option?). We reviewed all processing of personal data before the GDPR was implemented with the Information Governance Manager, which included publishing comments received regarding planning applications on our website. I have also discussed the publishing of contributor’s names and address with the Council’s Senior Governance Officer & Deputy Monitoring Officer who considers that there is not a breach of the GDPR as the Council has set out how the data will be used in the privacy statement which is set out above as part of the lawful processing of the application. Details on the website also highlight that Members of the public can send their comments to their District Councillor who can raise them as appropriate, so they can be taken into account when the application is considered. If you need clarification or wish to comment on these, then please raise them directly with Helen Mellors. The solicitor consulted by the Parish Council advised that until the planners’ recommendation was known, there is nothing to challenge. So the Parish Council will bide its time until then. In the meanwhile I do not know the steps being taken by those parishioners who wish to raise a separate challenge earlier than this. If there is a co-ordinating group for this can they contact me? 5 minutes for the applicant. At each point the Committee may question the presenter. The Committee then make final statements and vote on the application. The decision is either: accept the planning application (with such constraints as may be recommended), or, to reject the application. In the latter case, I imagine that the issue could be to return the site to a pre-application state through some enforcement action by SNC – but that is yet to be determined and may require additional input from Wreningham people or their legal representative(s). The Parish Council and “public” presentations must be closely aligned and mutually supportive. So it is vital that we maintain close cooperation. Proposal: 3 dwellings with associated garaging, access drive and amenity. The Greater Norwich Local Partnership have opened a consultation on a number of additional sites. Some of these are in or near Wreningham and you should be aware of them. More information is available on the page link here. The Wreningham specific information has been extracted and placed at the end of that page. You are encouraged to make your views known to GNLP but please also let your Parish Councillor know what you think. Proposal: Reserved matters application for appearance, landscaping, layout and scale following outline permission 2017/2828 for single storey domestic dwelling and garage to include access. Come and meet your neighbours, old and new. Have a chat over a coffee, biscuit & a bacon roll. 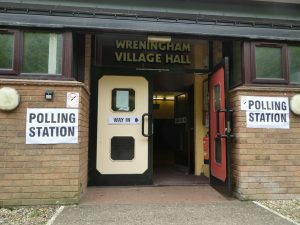 Local Parish and Ward elections are scheduled for 2nd May 2019. 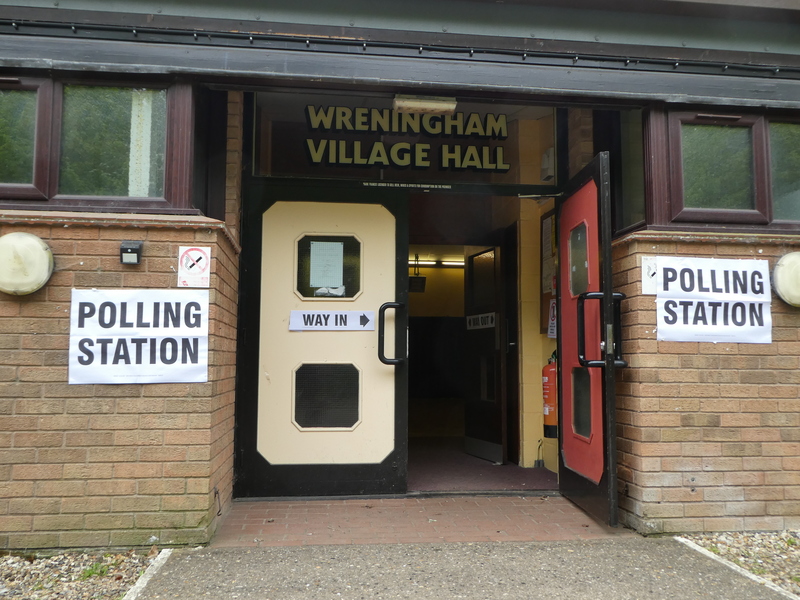 See SNC web page for all the details about being a voter, voting and being a councillor. A copy of the Agenda will be posted on the noticeboards at Top Row and The Reading Room at least 3 working days prior to the meeting. Enjoy two courses each in a different home and a dessert in the Witch & Wren. A great way to meet other village residents and enjoy some delicious cooking! More details in the latest Mardle. Interested? For tickets, information or providing a starter or main course at your house, contact Nicki Day by email. Monthly Carvery – back in the Autumn? Website Design by Barry Jarvis.